Think of Pink.Girl.Ink. as a lovely online magazine full of useful articles and a healthy dose of everyday motivation. Written by a psychologist and professional counselor (Stacy Lynn Mar), many of our posts are weekly installments geared toward self exploration, mental health and wellness, journal writing prompts, poetry writing prompts, as well as informative and educational posts pertaining to the art of writing, creativity, and overall better living. Our webzine Think Pink (an online magazine) prizes itself on publishing compelling literature, art work, poetry, and articles pertaining to women and women's issues. We cover topics ranging from interviews, health and beauty, spirituality, literature (short stories, prose, flash fiction, personal narratives/memoirs), poetry, artwork (painting, digital, photography) and lifestyle (working mom, career woman, writers life, life of an artist, and so on), and self-help/self-development. 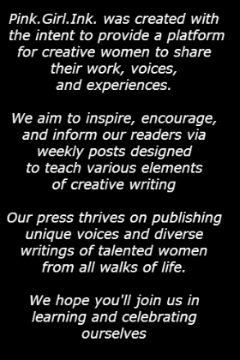 We are a very open-minded group of women who are interested in advocating for the voices, opinions, and lifestyles of women from all walks of life. We publish weekly posts, so we are always open for submissions from talented, inspiring artists/writers who wish to share their work or self-help advice. If published to the zine, your work will remain available in the archives section. At some point in the future we may offer a download edition of yearly contributions in free ebook format. You can find detailed information on Think Pink or Weekly Webzine submissions here. If you enjoy the prompt-writing posts on this site, or if you are merely looking for some writing inspiration, look no further! Written by seasoned poet, Stacy Lynn Mar, this little book is sure to get your creative wheels spinning! 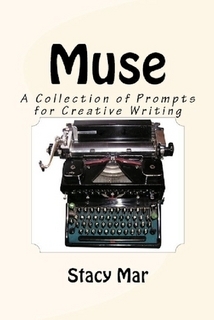 This collection of creative writing prompts includes fourteen chapters, each with a unique form of writing prompt. And each chapter has up to literally hundreds of prompts. If you used one prompt per day, this book has enough prompts to last up to four years! Purchase the ebook for a mere $4 by clicking the cover photo! The second edition print copy is coming soon! We are not an interactive writing community. Rather, we are a zine that simply offers writing prompts for your inspiration. We do not do comments or link ups. But please enjoy our weekly prompts nonetheless. Other Weekly Posts: Vary from writing help to creative exploration. Posted at intervals throughout any given week. Check back often for new & helpful material! Monthly Inspirational Almanac: During the first week of every month we'll post a collection of interesting facts, quotes, and writing prompts to creatively inspire your month. We publish quality material if and when we receive submissions worthy of publication. WE NO LONGER ACCEPT MANUSCRIPTS NOR PUBLISH BOOKS!! However, you can still find previously published books at the 'books for purchase' link. Join 2102 Others And Subscribe By Email! Erica Parks is the creator of the lovely banner image. The picture depicted is an illustration of Jennifer Cox (whom has given her permission for use). I offer a huge 'thank you' to both of these ladies for their wonderful work and generosity! An excellent online resource for poets. If you've had your work published with us, or even if you just enjoy reading the publications of Pink.Girl.Ink. we'd love to have our banner on your pages/blogs.